Asakawa, who came to Carnegie Mellon in 2014, is being honored for her invention of the Home Page Reader (HPR), the first practical voice browser providing internet access for blind and visually impaired computer users. The HPR debuted in 1997, enabling users to surf the internet and navigate webpages through a computer’s numeric keypad instead of a mouse. The HPR soon was widely used around the world and its interface technology has been adopted by many other voice browsers. Asakawa and the rest of the 2019 class will be honored and inducted May 1-2 at a celebration in Washington, D.C., hosted by the Inventors Hall of Fame and the U.S. Patent and Trademark Office. The Inventors Hall of Fame, a Smithsonian affiliate, has a museum at the U.S. Patent and Trademark Office headquarters in Alexandria, Virgina. The new inductees include David Walt of Harvard University, the inventor of microwell arrays, which revolutionized genetic analysis by making it possible to analyze thousands of genes simultaneously; Turing Award winners Ken Thompson and the late Dennis Ritchie, who created the UNIX operating system and the C programming language; and Jeff Kodosky and James Truchard of National Instruments, who introduced the graphical programming language LabView™. Posthumous inductees include Joseph Muhler and William Nebergall, who developed stannous fluoride toothpaste for reducing cavities, and Andrew Higgins, who invented the landing craft known as Higgins Boats used to land U.S. troops on the beaches of Normandy on D-Day in 1944. 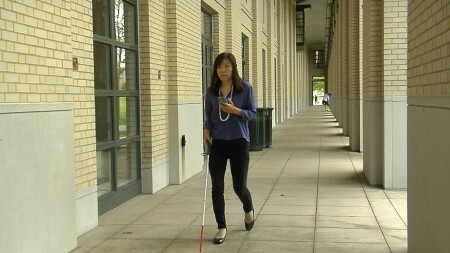 At Carnegie Mellon, Asakawa has worked with Kris Kitani, assistant research professor of robotics, and her students, as well as IBM Research, to create NavCog, a smartphone app that analyzes signals from Bluetooth beacons to help people with visual disabilities navigate their surroundings. The system has been deployed on the CMU campus, in a Japanese shopping mall and, most recently, at Pittsburgh International Airport. Asakawa now is working on an “AI suitcase,” a lightweight, motorized device that could guide people with visual impairments through airports or other public spaces.